I can remember a time when I didn't eat sushi. Early 20's, so naive. When you think back on your former self it can be a surprise to realise that you haven't always been the way you are in the present. At that point in my life I hadn't eaten a prawn, I wouldn't go near an oyster and I thought all sushi involved raw seafood so I kept it at an arms length. Yes folks I was as far from a foodie as you can imagine. Just as surely as the primordial blob evolved into humanity I too evolved. Sushi is a standard on my lunch menu despite bemoaning the dearth of the really good variety and just to ensure my former self is truly gone forever my absolute favourite is the raw seafood variety. Till recently sushi was as far as my knowledge of Japanese cooking extended. Beyond that I was intimidated. It appeared to be so steeped in tradition and history not to mention technique that I thought there was no way I would be able to cook authentic Japanese food at home. Enter Tokyo Cult Recipes by Maori Murato. From the get go Maori informed me I was all wrong about Japanese food. Yes there are sushi masters who train a lifetime to master their technique but Japanese food is so much more diverse and making it at home can be simple. Maori's words gently took my hand and guided me the full way through Japanese food, the food he grew up with and the food the Japanese population are eating on a daily basis. He starts where all good books start and that is with the essentials like correctly preparing rice in the Japanese style which surprisingly involves a number of rinsing and resting steps. 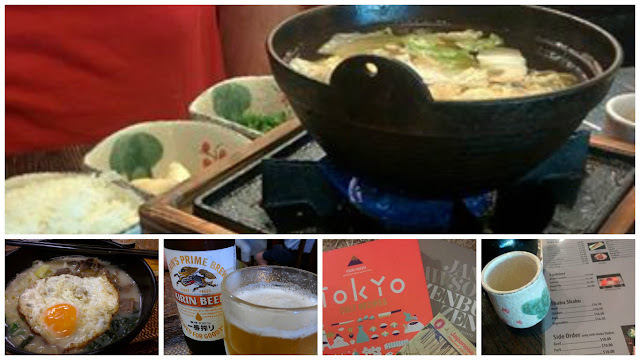 He takes you through making a dashi broth, an integral part of many Japanese dishes. This is where you get your first introduction to cooking with seaweed and katsuobushi (dried fish flakes). You will also be stepped through all the different variety's of miso and their uses. You will learn to pickle vegetables which are the perfect accompaniment to a Japanese meal. 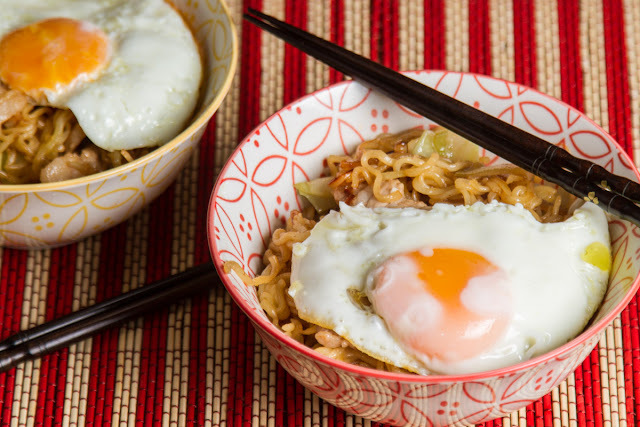 You then have a master class in the noodles like the Yakisoba we whipped up with Maori's help adorned with rich fatty pork belly and topped with a fried egg, as well as noodle soups soups such as Ramen that are so popular in America at the moment. You will learn to assemble a Bento Box which is the Japanese version of a lunch box. We ventured into the fried food territory with Tonkatsu (fried crumbed pork) that you would think would be more at home in a German pub than on Japanese dinner tables but when served as a Katsudon which is basically a fried pork omelette on a bed of rice you are in a Japanese world all of your own. Of course the book holds a touch of sashimi because where would Japanese food be without it's raw seafood and you will play around with Japanese desserts. 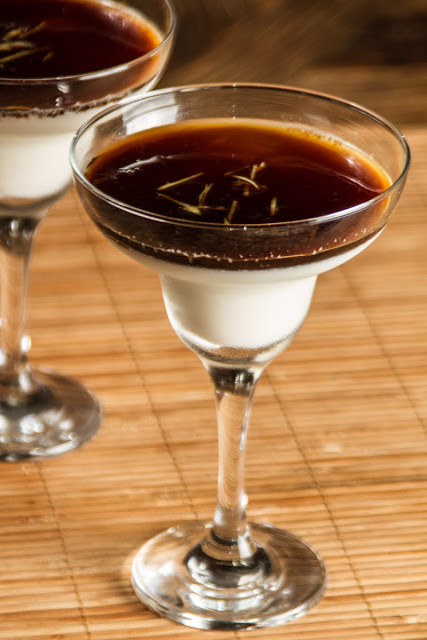 We indulged in the velvety smooth Gyunyu Purin (milk puddings) which we topped with a black sugar sauce. Maori does all this through his recipes as well a taking you on a visual journey. There are step by step how to style pictures as well as photography that takes you behind the doors of Japanese homes and restaurants. It is about as un-intimidating as you could hope for when taking your first steps into the world of Japanese cooking. Of course my journey to understanding Japanese cuisine never ends with one cookbook. Zenbu Zen by fellow Aussie Jane Lawson first presents itself as a tranquil drift down a calm river. It's pictures of sunlight on autumn leaves and frozen ponds will lead you to believe you are entering the more austere side of the Japanese culture when in reality you are actually being drawn into Janes story of a gaijin (foreigner) loose in Kyoto. This book is actually a hybrid, part cookbook part memoir Jane leads you through her memories of Kyoto through a series of tales interspersed with recipes. 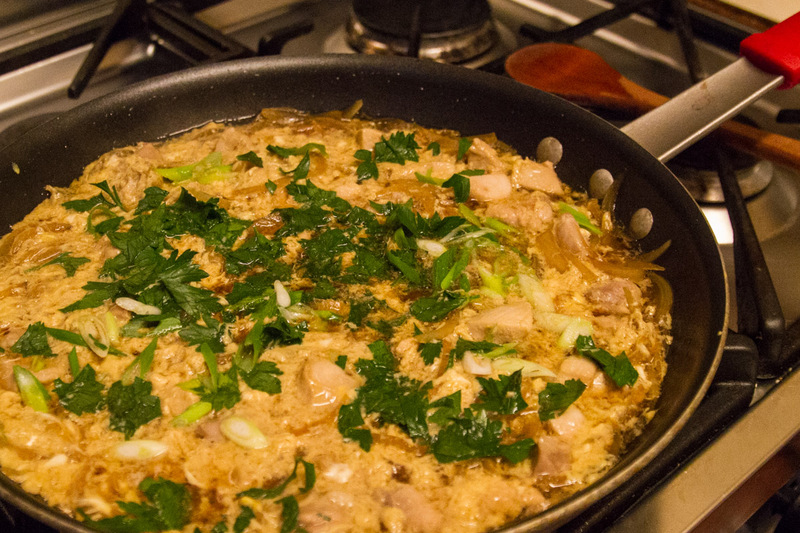 Jane bought Oyakodon to our dinner table. Like many Japanese dishes this recipe starts with a dashi, in this case a Tori Dashi which is essentially a chicken stock with the additional of the ever ubiquitous seaweed. Wanting to get the flavours right we hunted down Kombu for this dish, no mean feat seeing as it is illegal to import into Australia. Once found we were not disappointed in how foreign this ingredient is to the westerner. Opening the packet of dried papery seaweed it soon became apparent that it was not just seaweed we had here, with it came a considerable amount of sand and possibly some sea life of the crustacean variety, no wonder the lady in the Asian supermarket warned us about rinsing it off before using it. Once re hydrated the Kombu became thick and leathery and I am certain if we had not found this elusive ingredient at the shops we could have just gone to the beach to collect the seaweed washed up on shore. Making the dashi turned out to be the time consuming portion of this recipe, once done it was a matter of simmering some dashi with onions, adding some diced chicken and finally pouring in some beaten eggs to form a loose omelette. Served on rice the flavours were subtle but topped with a little Shichimi (Japanese 7 spice powder) it was a tasty dish, so much so it became my lunch for the next three days. The more Japanese food we cooked the more I wanted to experience. We ended up hunting down local Japanese restaurants to seek out more complex dishes that we had not had time to cook in our own kitchen. The restaurant Mr Shabu Shabu located in the City West region of Canberra has become a fast favourite and I have already been back a number of times to indulge in their cook your own hot pot's called...Shabu Shabu. These guys do a mini single serving Shabu Shabu where each person is presented with a bubbling broth on top of a small burner and a selection of ingredients such as mushrooms, beef, pork, and noodles to pop into your broth and cook to your own liking. The broth itself was clearly in the vein of what we had been making at home, a seaweed infused clear stock but this was more complex with a sweetness and depth that suited it being eaten as a soup. This is the type of dish that is best eaten out, with good company and an insatiable appetites. With Shabu Shabu bringing the joys of cooking your own food at the table we decided to host a tempura party for two at our very own dining table. The perfect host to guide us through the techniques of this slightly kitsch dinner was Charmaine Solomon. Her timeless book The Complete Asian Cookbook is the perfect reference point for everything Asian and she didn't disappoint with her Tempura. 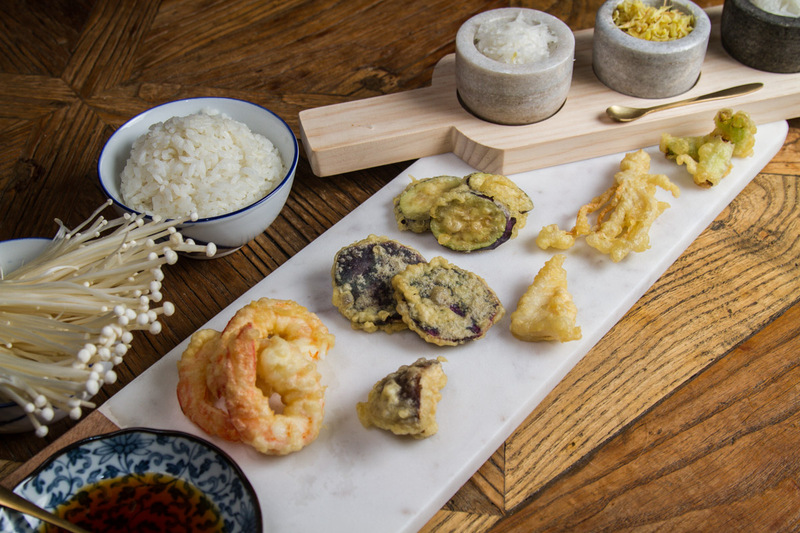 The light airy tempura batter when eaten straight from the fryer at the table is a crunchy delight and is ideal for all manner of seafood and vegetables. With a simple bowl of Shoyu (light Japanese soy sauce) as an accompaniment the produce is given space to really shine. Every cultural food immersion comes with surprises, unexpected twists and turns and the food of Japan has been no exception. The images most easily conjured to mind of expertly cut slivers of fish and tiny serves of daintily rolled sushi are only a very small part of the Japanese cuisine. The Japanese have somehow hidden from the world that they want to hunker down on a big piece of fried pork or slurp up a massive bowl of noodle soup, they have kept hidden their appetites for big serves, greasy fry up's and sweet as sweet desserts and it turns out they are just like the rest of us. Now go get cooking and see for yourself. Hey thanks for the mention - glad you enjoyed the Oyakodon. Ps - it's tori dashi not toro which would be tuna ( or bull in spain! he he.. ) ;) Keep up the Japanese food journey. Hi Jane, Thanks for reading and thanks for the gorgeous book on Japan, it has joined my extensive cookbook collection and I can dream that one day I would write a book that good. Ah those tricky Japanese words, going to go correct that right now. Lucky the spelling of it doesn't affect the eating of it!